Explore the land of faeries to find the hidden wealth with this slot by Betsoft gaming! This 5 reel 3 row online slot game with 10 paylines has been developed by Betsoft gaming and is bound to transport you to the land of fairies and pixies. The game unfolds the ancient classic fable of faeries with an interesting blend of the modern e-gaming world. Once you launch the game, the Faerie Queen is going to lead you to the magical land hidden deep in the woods where the treasure awaits you. When you enter this fairyland, you get to see beautiful pixies, faeries, the Faerie Queen herself and some other interesting creatures. Land three of these queen symbols on the reels and she will unlock the door to her secret laboratory for you, where there are flasks for the magic jackpots and their droplets that you have to catch to trigger the jackpots. Along with these, you also get to enjoy an array of interesting bonus features like buy Free Spins, Double up and the Free Spins bonus game around which the game revolves. How to Play Faerie Spells Slot? Just like all their games, Betsoft gaming has presented an amazing collaboration of trail jackpots and bonus features in this 10 payline slot game which has an interesting bonus round and brings a large number of chances to win in the base game as well. If you want to enjoy the gameplay you just have to set the amount you want to stake and spin the reels. However, to do so, you will have to use the following buttons that can be seen once you launch the game. Bet: When you launch the game, you will be able to see different values written below the reels, these are the amounts that you can bet and range between 01.0 to 10. Along with this “ +” and “-” options are also present on either side of these to help you set the right amount. Spin: This button looks like two semi-circular arrows enclosed in a circle. Click on this to spin the reels of the game. Double up: It is a small circle present to the right of the spin button and can only be used when you get a win. It lets you use the gamble feature in which you get a chance to double your winnings. Auto Spin: Next to the spin button, you will be able to see one more button which looks like a circle that encloses semi-circular arrows and small triangle which looks like a play button in the center. This is the autoplay button that lets you spin the reels of the game automatically without using the spin button again and again. When you click on it, a pop up menu will appear on the screen asking you to set the bet per line or the line bet which can be any value between 0.10 to 1, the number of Free Spins you want to use this feature for, and if you want this feature if you win or lose by a certain amount. Buy Feature: This option lets you buy Free Spins if you are tired of waiting for them. When you click on this, it will show the number of spins you can buy using the game funds. Per payline, only the highest win is paid. Guardian Tree is the wild and can substitute for all symbols except the Faerie Queen and the scatter symbol. 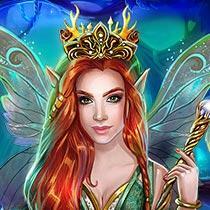 Three or more Faerie Queen symbols on the reels trigger Free Spins. Free Spins are played with a new set of symbols. During Free Spins the reels present 1024 ways to win. This online slot by Betsoft gaming is based on fantasy theme and is going to take you the faerie lands. All the symbols used in the game have been vibrantly colored, giving a delightful appeal to the gameplay. The reels of this slot have been placed deep, in the woods of the fairyland with vines, creepers and plants visible at either sides. The transparent reels are enclosed within green vines and spin in the foreground of blurred glimpses of the magical world accompanied with a charming track playing in the background. Likewise, the symbols used in the game have been wisely chosen and include faeries, pixies, magical trees and fireflies. These symbols have been intricately designed and give a surreal appear to the gameplay which is going to leave you mesmerized. The High paying symbols used in the game are various 'magical' figures that you would see in a fairyland. These include a fairy with purple wings, a red pixie, the wisdom tree, firefly and a golden tiara. Betsoft has been generous with the use of HD graphics while designing these symbols and they have been brightly colored which is indeed going to leave you spellbound. The magic wand which is beautifully painted pink and the water droplets are the fantasy based standard symbols used in the game. Along with these, the alphabets A, K, Q and J are also some of the low paying symbols which have been colored golden and serve the dual purpose of keeping the game play realistic and majestic. Wild Symbol – The tree guardian symbol which looks like a speaking tree with humanoid face, is the wild symbol used in the game. It replaces all the symbols with the exception of the Faerie Queen and the diamond symbol to generate more winning combinations for you. 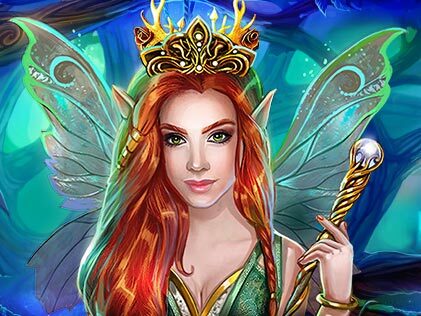 Scatter – The Faerie Queen which is the green fairy, is the scatter that help you win Free Spins when you land three or more of them. Along with this the Diamond symbol also serves as the scatter symbol in the Free Spin round. It explodes by itself every time it appears on the reels and reveals a cash prize for you. Toadstool – Everytime you spin the reels of the game, you are definitely going to hope to land these symbols on the reels as they bring a cash prize for you each time they appear. But the queen as her say as well, and the cash prize is released only when a queen symbol is present on the reels! Jackpot Symbols – This slot game also has four jackpots symbols, each for one of the jackpots. The name of the jackpot they contribute towards has been written on them and each time they appear on the reels, they help in completing the trail for their respective jackpots. These symbols include; Riches represented by a purple flask with a gem on the top, Wealth (green flask with a flower on the top of it), Luxury (a glass bottle filled with a pink liquid sealed with a cork and a leaf on the side) and Plenty (filled with golden liquid). All these symbols have been intricately designed and stand out on the reels among the other symbols, reflecting their significance. Treasure is always hidden in unlikely places following the same lines, the treasure in this game comes from the toadstool symbols. Although, it may not sound too pleasant to hear but the marvelous cash prizes it awards in the presence of the Faerie Queen are definitely going to win your heart. This feature lets you gamble the amount that you win in the spin. When you click on this it, you will get an option to choose between heads or tails. After this, the coin will spin and if rests on the side (head or tails) that you chose, your winnings will be doubled. But if you choose the wrong option, you may have to lose your winnings. To make it easier for you, you have also been given an option to choose if you want to stake all of your winning or half of them. So be careful every time you decide to use this one! The Free Spin bonus round is triggered when you get 3 or more Faerie Queen symbols on the reels of the game. Depending on the number of these symbols you may win upto 25 Free Spins. Since when you land 3, 4 or 5 of these symbols, you will get 10, 15, and 25 Free Spins on the jackpot reels respectively. Once these Free Spins are triggered, you will enter the bonus round of the game. In this round, all the symbols on the reels are replaced with new symbols. There are 1024 ways to win in this bonus round and you can also trigger one of the four jackpots as the jackpot symbols are added to the reels. In addition to it, one more special feature has been added to this bonus game, the exploding diamond. This diamond symbol explodes every time it appears on the reels and reveals a cash prize not only this it also collapses after exploding which results in more winning combinations. Just like all Betsoft online games, this game also consists of interesting jackpots. There are four of these jackpots; Riches which brings the maximum wins, Wealth, Luxury and Plenty. They can only be triggered once their trail has been completed thus showcasing 'jackpot trail' peculiar to Betsoft games. Players can only trigger these jackpots in the Free Spins bonus round where these jackpots symbols are present on the reels and contribute to their respective trials each time they appear. The jackpots, their trail lengths and the wins that they bring in your respective currency units have been given below to give you a glimpse of the life changing wins that this game is capable of delivering. This online slot machine has been developed by Betsoft which is known for its cinematic 3D slots and mobile gaming. It has been producing superior quality online games which have been loved by the players all around the world for more than a decade. Attributed to its continuous endeavor to provide nothing the best to the players it has also won numerous awards with the latest of them being the Best Mobile Gaming Provider Malta Gaming Award 2018. With that being said, it releases a number of online slots every year with some of its proprietary features like trail jackpots and buy Free Spins. This online slot is another masterpiece by them, embellished with vibrant colors and HD graphics and is definitely going to be loved by the players. Betsoft gaming has amazingly blended the ancient fable of faeries and their riches with this online slot in which the faeries are going to unlock the doors of their fantasy world for you. Spin the reels to enter the fairyland and meet these faeries, pixies, wisdom tree and fireflies. Magic reflects from each aspect of the game and the vibrant background, bright symbols and perfect music in the background add to it. This game has some interesting features like double up which lets you gamble your wins and buy Free Spins but is centered mostly around the Free Spins bonus round. It is triggered when three or more Faerie Queen symbols land on the reels and lead you to the majestic laboratory which consists of flasks that are filled every time you collect the drop of the respective jackpots in them. These drops act as the trails of the jackpots showcasing jackpot trails which can be seen in all the by games by this software brand and bring along a sizzling chance to grab life changing wins. Please enter your review for the Faerie Spells Slot.